AdvantEdge Card: You must have an AdvantEdge card to get Price Chopper's sale prices and gas savings. If you forget your card your cashier can look it up using your driver's license. Price Chopper allows the use of both a store coupon and manufacturer coupon on one item. Price Chopper accepts one manufacturer coupon for a B1G1 sale. Price Chopper accepts valid internet (printable) coupons with a value up to $5 off and also accepts B1G1 internet coupons and FREE offer internet coupons. All Price Chopper stores double coupons up to $0.99, except when prohibited by the manufacturer. They will double up to 4 coupons for like items per day. So, for example, if you have a coupon for $0.75 off it will automatically double to $1.50 off! Sometimes a coupon will state do not double and should not be doubled, though if the barcode number starts with a 5 the coupon will usually double automatically. Price Chopper periodically releases store paper coupons and ecoupons. The store ecopuons will have the Price Chopper logo on them and both may be combined with manufacturer coupons for additional savings. Store ecoupons automatically come off your total at the register. Make sure you scan your Price Chopper Advantage Card at the iSave Machine, located at the store entrance. 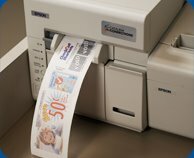 The iSave Machine can have some great coupons, both store and manufacturer as well as $$ off your total purchase coupons. For every $100 you spend at Price Chopper you will earn a $0.10 off per gallon Fuel AdvantEdge Discount. Price Chopper will often feature gas promotions in their ad specifying that if you buy certain qualifying items will earn additional gas savings. These are featured in this sites weekly matchups. All gift cards that Price Chopper sells, excluding Price Chopper Store gift cards count towards gas savings. So it's a great idea to buy all gift cards you may be giving for Birthdays, X-Mas, (yourself!) at Price Chopper in order to have them count toward your gas savings. You can load SavingStar Ecoupons onto your Price Chopper card HERE. These paperless coupons are great because they can be combined with manufacturer or store coupons for additional savings. Savings can go into you paypal account or you can request them via bank deposit, Starbucks card, etc. Like many other national supermarkets, Price Chopper registers have catalina machines. Catalinas are coupons that print after your receipt at checkout. Some will be ads, information about upcoming catalinas or coupons. Others will be coupons that you can use On Your Next Order (OYNO). Example: Save $4 on your next shopping order. These coupons can be used towards any item/s and usually expire in 2 weeks. You get these coupons when you buy a certain qualifying items in the same transaction. For example: Buy 3 Dole Real Fruit Bites - Save $2 OYNO. Another type of catalina requires you too spend a specific amount on qualifying items in one transaction to get back a OYNO coupon. This will be advertised in Price Chopper's ad and are included in the weekly matchups. Example: Spend $15 or more on the products below in a single transaction, get $5 off your next shopping trip. These offers are usually based on the shelf price (regular price) of the items, not the sale price (though the ad will say they are not). Based on the higher shelf price it can be easy to reach the amount needed to get the catalina coupon and combined with coupons you can sometimes get items free to very cheap! Examples HERE. Some shelf prices may differ slightly from store to store so you always want to make sure your shelf price meets or exceeds that amount needed to get the Catalina coupon. Also, I always check to make sure the small green light is one on the catalina machine next to the register (or just ask the cashier) to insure that my catalina coupons print though I've never had a problem. Sometimes the catalina coupon will take a few seconds after your receipt to print so you have to wait for it. Sign up HERE for Price Chopper coupon mailers. Price Chopper participates in Upromise, a great program that helps you save for college tuition. Sometimes stores may mistakenly take down a sale tag for multiweek sales before the sale is thru or not have the sale tag up at all. So if an item that I've listed as on sale does not seem to be on sale it likely is and the tag just isn't up. You can still grab the item and ask for the price at checkout, you always have the option to not purchase it. Be on the look out for coupons tearpads and small Smartsource coupon dispensers throughout the store. Watch out for products that have limits (ex. Purex - $1.99 *limit 3) because if you buy more then the limit in the same transaction the additional product/s will ring up at regular price! Many items though do not have limits and if they do the limit will be listed in the matchups. Price Chopper is a great place to find NBPR's. Some Price Chopper prices may vary slightly from region to region. How do you get the PC mailers? I clicked on the link you posted but it doesn't work. Where can I email my shopping trips to help others? The facebook page? Sorry, Price Chopper no longer has a signup for these, they seem to be sent out randomly.